Stella is one step from leaving her honky tonk town when bad-boy Dane roars down Main Street on his prized Harley-Davidson. Their dangerous romance keeps the locals talking, but when Dane is arrested after a deadly bar fight, the couple discovers their love runs deeper than their reputations. Fans of “Baby Dust” will enjoy reading the backstory of their favorite characters in an edgy romance that moves from Stella’s small town bordering the Ozarks to the famous Missouri State Penitentiary, proving that the best kind of love is the one that endures. This isn’t your ordinary love story. Rich in detail and vivid descriptions, the author easily transports the reader to the scenic Ozark Mountains and small town life in Holly, Missouri. This emotional story packs a powerful punch, the passion and intensity of Stella and Dane’s love is inspiring and will resonate with you long after the last page has been read. 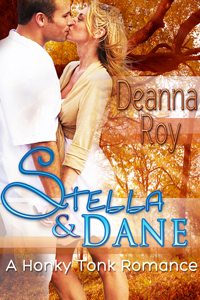 Stella and Dane” was simply a wonderful romance, simply and complex, sweet and hot, pretty much all at the same time. There was no way I’m going to stop reading. A pull you in and not let you go kinda book, “Stella and Dane” is a fast paced romance perfect for a summer afternoon. This story puts the reader on an emotional rollercoaster as events spiral out of control for our couple. It’s a well-written story with realistic characters that you might not always like but are always interested in. Readers who like high drama will definitely like this. It will definitely twist your heart all up and leave you spinning. Sometimes the author had me laughing and a few other times I was crying my eyes out. The author captured the hurt and pain of losing someone that is very important to you. If you like intense and emotionally filled reads, then this is the book for you! If you’re into emotionally charged stories full of growth and happy-ever-after love by an author who seriously knows what she’s doing, I can highly recommend Stella & Dane: A Honky Tonk Romance.